Boo! Halloween often sneaks up on us just like that, and the cost of costumes, candy, and decorations can be downright scary. While most people plan in advance for the food, travel, and gifts for the “big” holidays, like Thanksgiving and Christmas, Halloween often goes forgotten until it’s suddenly here. Many of us find ourselves buying last-minute everything, which usually comes with a hefty price tag. 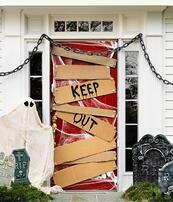 Here's how you can avoid buyer's remorse after all the Halloween mayhem and fun has been had. While we can often find deals on fun-sized chocolates and candy at bargain stores, and transform our kids into ghouls with some makeup and old clothing, decorations can often do us in. Whether you're hosting a party at home or scaring trick-or-treaters on the big night, interior and exterior decor can get expensive. The easy answer? DIY! 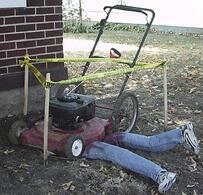 But after scouring the internet, many so-called “cheap” DIY ideas are far from it. In fact, many ideas seem like they could actually cost more going the DIY route rather than simply purchasing the real deal. (Not to mention all the extra time it takes, which is something many of us don't have a lot of these days.) So here are some of the coolest (and cheapest) decoration ideas that you can do this Halloween without breaking your budget! There's always that one creepy house in the neighbourhood that all kids tell stories about and dare each other to ring the doorbell. Well, now your house can be that house! 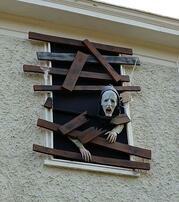 One surefire way to add some spook to your home is by "boarding up" your windows and doors. Instead of potentially damaging your home with the real deal, you can cut up old cardboard boxes to make it look like boards and then stick them onto your doors and window frames. Check out houzz.com for more ideas. You’ve made the marshmallow ghosts and pumpkin-faced cupcakes, but something’s missing from the table to really creep out your guests. How about some "specimen" jars? 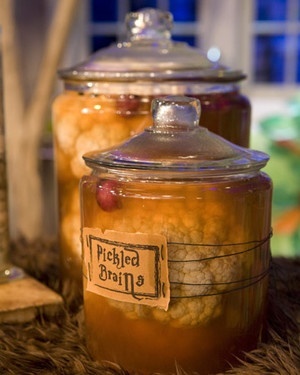 Turn your spread into Frankenstein’s lab with jars of what might look like body parts soaking in formaldehyde or animal x-ray jars. FYI: Cauliflower makes a great brain, as pictured, while peeled grapes make good eyeballs. Shop your produce or deli department for more inspiration! See more Halloween decoration ideas from Martha Stewart. Farmers have long been experts at scaring crows away from their crops using scarecrows. 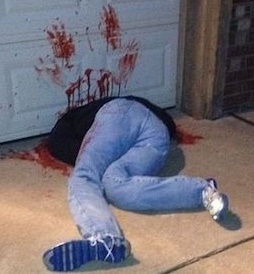 You can take a page from their book and use an old pair of jeans to scare any visitors coming to your home. Stuff the jeans with whatever you want, attach an old pair of sneakers or shoes and then protrude the stuffed jeans from any object you like, such as a lawnmower or garage door. Check out Pinterest for other cool ideas. Construction paper cut-outs are for kids, right? Not any more! 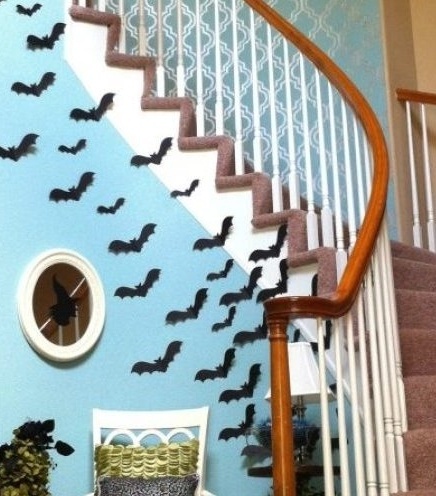 You can create your own spooky hallways and entry ways with just some construction paper and a pair of scissors. 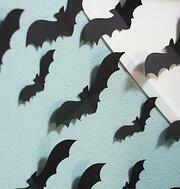 (Bat cave, anyone?) If your kids are old enough to safely use scissors, get them involved too! Check out this awesome bat creation by Landeelu. Zombies are all the rage thanks to shows like The Walking Dead and movies like World War Z. 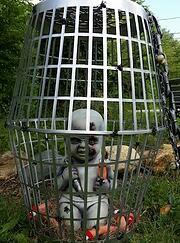 But it’s not easy to cage a full-grown zombie on your front lawn, now is it? Instead, combine the fear of zombies with the creepiness of dolls by spray painting two laundry baskets to give them a metallic look. Then, place your "dolled up" zombie doll inside. If the doll happens to also be a talking one, your display is golden! See more from Penny Pincher. Who wants to deal with all that cotton webbing, or take the time to make “webs” with yarn? 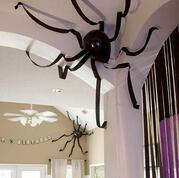 Spider balloons are the way to go! All it takes is a black balloon with a few leggy streamers, and in no time you'll have an army of spiders crawling across your walls and ceiling. See more from Gurudecor. Mummies are so passé (and all those bandage rolls can get pricey). You know what's creepier and a lot cheaper? Body bags! The image alone can freak people out, so you know it'll give guests goosebumps. 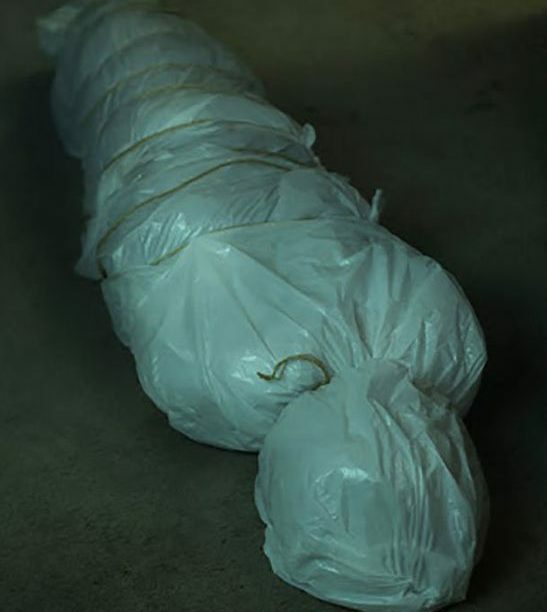 Take some plain white garbage bags, stuff them with whatever you can find, and make a body out of it. Then tie some rope or twine around certain parts to add to the effect. (FYI A milk jug makes a good head!) Another great tip from Penny Pincher. 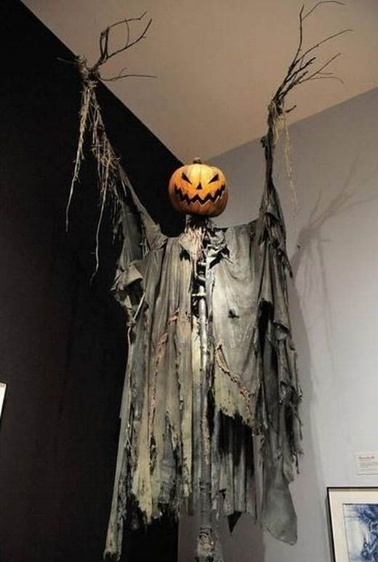 This one is pure nightmare fuel made with nothing but a couple of PVC pipes from Home Depot, branches from a tree, a torn up (and discoloured) sheet, and any ol' pumpkin head. Shine some lighting on it just right and it'll have all your guests doing a double-take. See more from Lifestyle Space. Before you recycle, remember: Halloween! Keep plastic milk jugs on hand (and/or ask co-workers and friends to give you theirs) and you can make unique porch lighting. Simply draw a funky ghost face using a permanent black marker, then cut a hole in the back of each jug and insert lights from a string of Christmas lights. (White works best, but coloured lights can work too!) 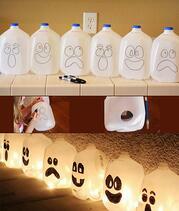 You can stick all the jugs together side by side using some tape, which helps keep them altogether, then voila! You've given your porch or walkway a ghoulish new glow. See more from Holiday Crafts. There are many ways to save on Halloween, these are just a few favourites! If you've got any great and inexpensive DIY Halloween decor tips, please share with us in the comments below. Otherwise we hope you have a frightfully debt-free Halloween!